New Delhi Sep 15 (IANS) Prime Minister Narendra Modi on Saturday hailed the Indo-Tibetian Border Police (ITBP) personnel for always being there for the people in the hour of need and also for participating in the cleanliness campaign. "I would like to extend my regards to ITBP personnel. You are always there in the hour of need whether it be on borders or during a calamity. 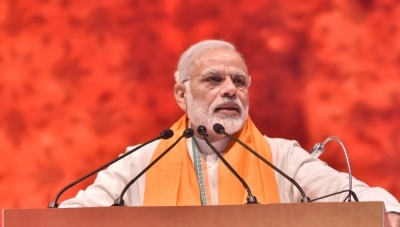 You have made the country clean by being a part of this mission " Modi said during the launch of 14-day Swachhata Hi Seva Movement through his NaMo application which will go on till October 2. Interacting with the Prime Minister Sadhguru of Isha Foundation said: "Today level of enthusiasm towards Swachhata campaign is visible and I see this during my travels. "The necessary impetus in this direction was needed. Tremendous things have happened thanks to our Prime Minister. It is great that the Prime Minister is talking about such things. "Swachh Bharat is not a movement of any government or any Prime Minister. This is a nation s movement." Sadhguru also highlighted on how the drainage system of the world s oldest civilisation of Mohenjo-daro had left the British in awe. "We are a nation with over 10 000 years of culture. The drainage systems of Mohenjo-daro had left even the British in awe. India has a long history of both personal and public hygiene " Sadhguru added. Earlier Modi also appealed to the cooperative sector to continue their efforts in furthering cleanilness while interacting with the citizens from Gujarat for sharing their experiences. "Uncleanliness damages the health of the poor. It pushes them into illness. Diseases like diarrhoea spread due to uncleanliness. It costs lakhs of lives every year. And we should feel happy that due to the cleanliness movement there have been drastic fall in the number of deaths due to diarrhoea " the Prime Minister added. "Thus I appeal to the cooperative sector to continue their efforts in furthering cleanliness." Modi while interacting with the citizens from Madhya Pradesh s Rajgarh hailed them for using the Gobar-dhan (dung) scheme. "People of Rajgarh have used the gobar-dhan scheme seriously. Working towards making people aware about cleanliness is a different thing but to tackle with the waste that we produce is the biggest hurdle. Thus we have to make waste management more effective " Modi stressed.